Up Dutch Kills, with a paddle. 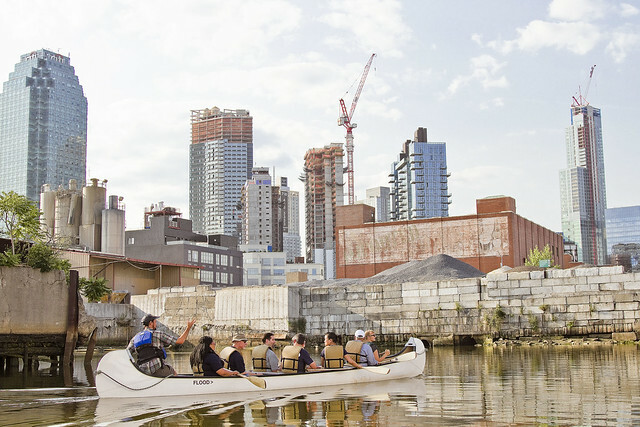 My pal T. Willis Elkins, who’s the Project Manager of Newtown Creek Alliance and the co chair of the Newtown Creek CAG, sent out an invite recently inquiring whether I might have any interest in taking an evening paddle with employees of the NYC DEP on my beloved Newtown Creek – specifically up the Dutch Kills tributary in LIC and a couple of other points of nearby interest in Booklyn. T. Willis is also one of the show runners at North Brooklyn Boat Club, found in Greenpoint under the Pulaski Bridge, so that’s where our little crew met up. We donned life vests, listened to Will’s safety speech, and got into canoes. I chose to go out in the smaller of the two boats, presuming that it would be a better spot to take pictures from than the enormous version that everybody else would be in. The only condition which T. Willis set down for the trip was that everybody would have to row, but… cardio, right? T. Willis had timed our trip to coincide with low tide on the Creek, which is required to pass beneath the MTA’s non functional Cabin M railroad swing bridge which is – at best – just a few feet over the water. 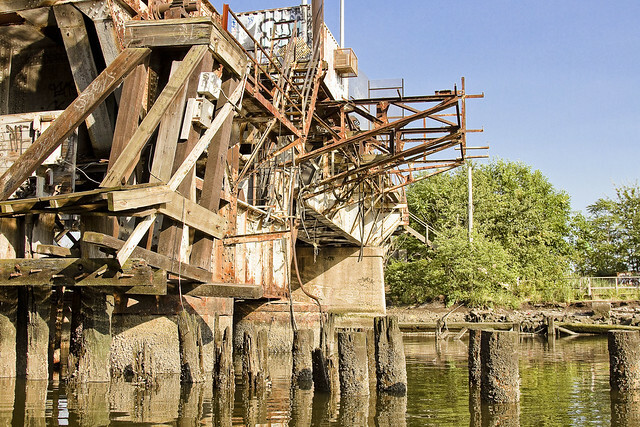 We headed into Long Island City along the Dutch Kills tributary of Newtown Creek, and pictured above is the second of the bridges you’ll find along the tributary – Cabin M – which is a truss bridge that can actually open and close. The shot above looks east along Cabin M towards the SimsMetal dock. DB Cabin services the Lower Montauk branch of the LIRR’s freight operations, connecting the Wheelspur and Blissville yards. The Long Island Railroad tracks follow the main stem of the waterway eastwards into Blissville, Maspeth and eventually turn north towards Fresh Pond. This traffic is maintained and operated by LIRR’s contracted freight partner, the NY & Atlantic. Cabin M is part of the now defunct Montauk Cutoff tracks, which provided access to the Sunnyside Yards from the freight tracks along the Creek. The Montauk Cutoff itself was detailed in this post last year. 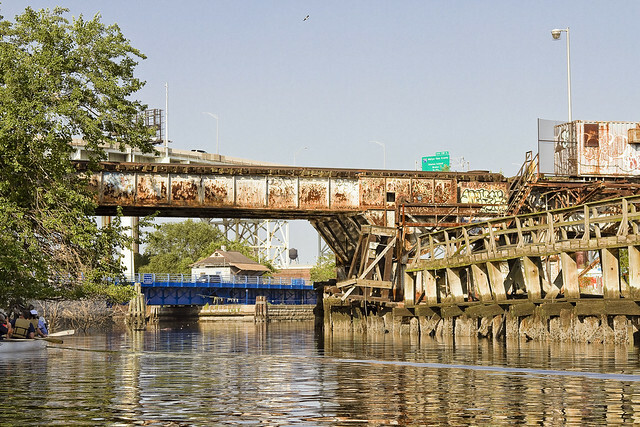 The head of Dutch Kills sports a “turning basin” built for shipping, which isn’t used in modernity due to that non functioning rail bridge – DB Cabin – found at its intersection with the main stem of Newtown Creek. The turning basin is nearly a mile back into Long Island City, and you can really get a sense of how much new construction is happening in LIC from back here. 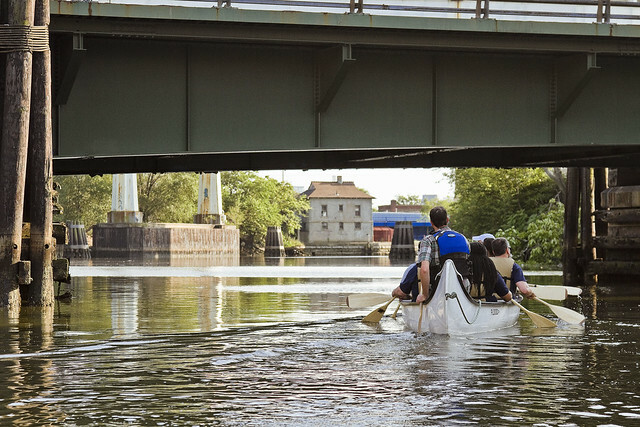 There’s also a couple of pretty large combined sewer outfalls – CSO’s – back here, which everybody’s friends at the DEP whom we were paddling with are actually responsible for. The pipes here are connected to the Bowery Bay Sewage Treatment plant in Astoria, for the vulgarly curious. I’ve shown you before – lords and ladies – the abandoned fuel barges found back here, which have been allowed to rot away into the water – in previous posts. 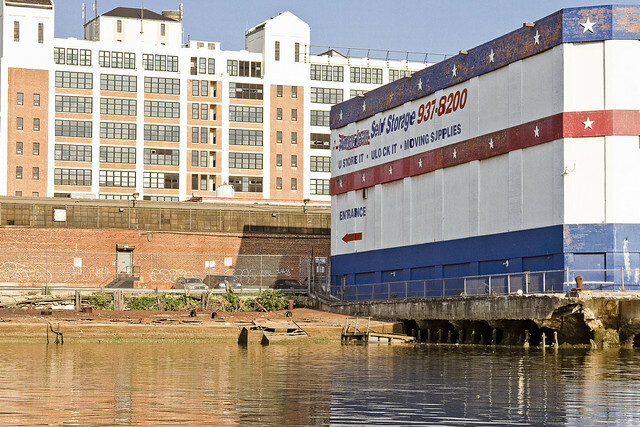 I’ve also described to you the “situation” which the American Warehouse company has found themselves in during the early 21st century – wherein the undermining of their site by the waters of Dutch Kills have cost them a pretty penny to shore up. Many, many million pennies, I’m told. On our way out, we passed under the Hunters Point Avenue Bridge. 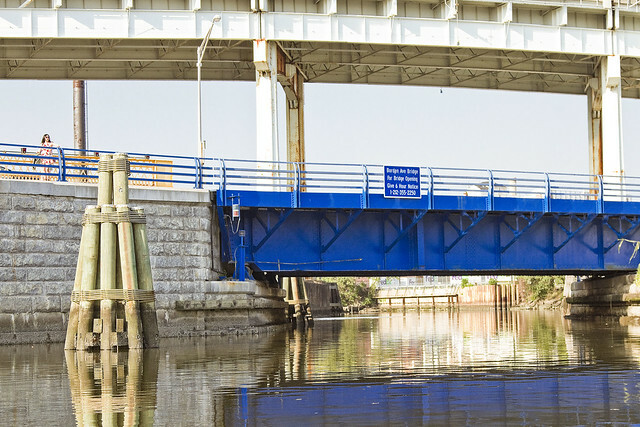 All of the NYC DOT administered bridges on the Newtown Creek and its tributaries are maintained in working order, and I’ve witnessed this single bascule drawbridge being opened and closed. Heck, I was a parade Marshall for its centennial, and we even had a parade. 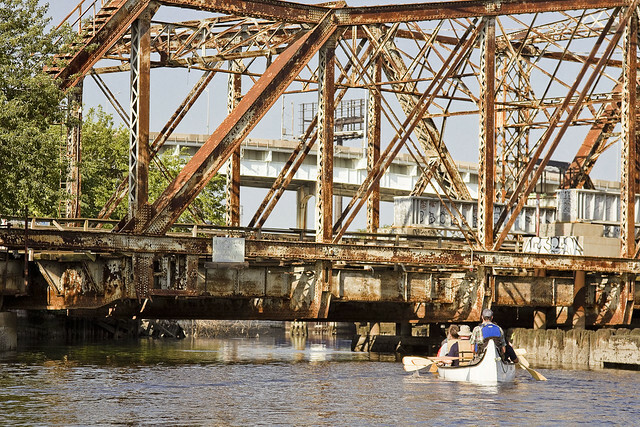 Our little group visited a couple of other spots nearby, Unnamed Canal and Whale Creek, then rowed out to the Creek’s intersection with the East River for a bit. 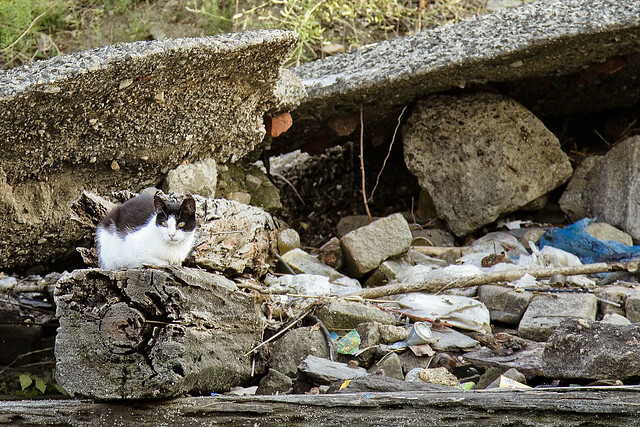 Along the way, I spotted this feral fellow in Greenpoint.